The first thing you'll notice about A City Sleeps upon launching is the outstanding visual design. The main menu, showing the cityscape behind Poe's semi-silhouetted apartment with a futuristic neon palette is quite beautiful. This quality is a constant throughout the game, but A City Sleeps has many aspects up its sleeves ready to surprise you. A City Sleeps is a dual-stick, bullet-hell style shoot-em-up in which you control Poe as she travels through the dreams of people infected by the Kami. Traversing with the left analogue, shooting with the right; Poe can fire projectiles and automatically switches to a melee attack for nearby foes. The twist in the gameplay is that everything you experience works in tandem. 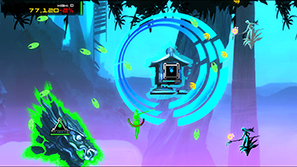 The enemies appear, shoot, deploy projectiles all in time with the soundtrack; as do your own. Bullets flash alternating colours, act suitably to the sound they're producing, and will draw that track silent if destroyed before the conclusion of their segment. This creates a real spectacle, that on several occasions took my breath away and is what sets it apart from many other shooters. You have an array of abilities at hand to aid you throughout the levels. Poe can call forth Ghosts when an object with an available socket appears on the screen. You start out with two, Mercy and Anger. There are two types of socket you can attach these to, square and triangle, and they display different effects. The square will radiate a nearby pulse that will affect those caught in it; healing Poe with Mercy, or causing damage to enemies with Anger. The triangle slot will launch a projectile ability across the screen. These are integral to your survival. I would not have been able to get past any level even on the easiest setting without them. The most beneficial form of attack is melee. Upon landing a hit with her sword, Poe's special meter increases. When filled, you are able to launch an enormous melee attack for a few seconds that does devastating damage to those it comes in contact with. This is especially helpful against some tricky foes that spew bullets and have considerably more health than others. 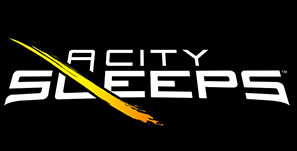 The reason you'll need to incorporate these different aspects while playing is that A City Sleeps is a very, very, difficult game. After my first encounter with level one on the easiest setting I had no idea how I'd be able to progress in the game, yet alone complete it. Enemies fire huge number of bullets across the screen forcing you to duck and weave while still damaging them. There are times when the screen is just full of bullets. In that first level you will die several times. It takes a little bit of time to become accustomed to the numerous mechanics that need to be utilized, but once you get the hang of it you'll experience smoother progression. The musical and visual combination is amazing throughout every part of the game. 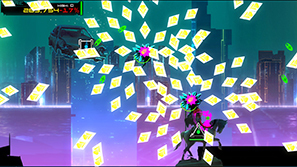 It is no great surprise that developers Harmonix, known for Amplitude and Rock Band among others, have managed to create such an effective synchronised visual performance within the gameplay. The audio is so spot on that there are times you'll stop thinking of it as a piece of music, rather, the noise that a specific character or projectile is making. In the third stage each section's title appears on screen at the exact point the words are mentioned in the vocals. It's these simple yet very effective things that have such a memorable impact. The art design is thoroughly gorgeous as well. Not that you'll have a lot of time to admire the expansive backgrounds to the levels. Wave your concentration for a few seconds and you're likely to lose a large chunk of health. Poe's hitbox is relatively small, shown as a green circle around where her heart is. I initially found it difficult to disassociate myself with Poe and concentrate purely on guiding that circle around avoiding projectiles. 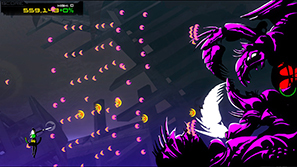 There are three unique levels, with three stages and a boss fight in each. 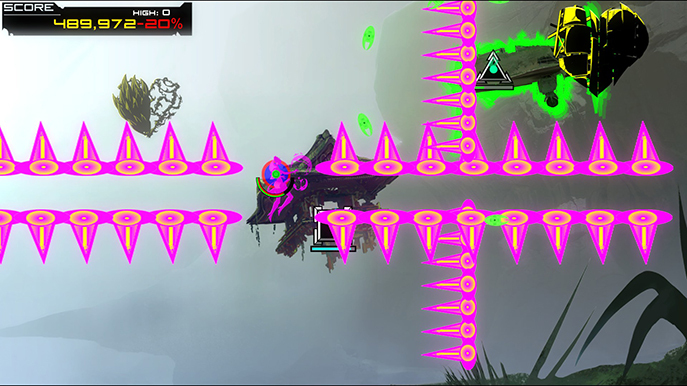 Further, there are five variations of the levels with greater difficulty. Only the opening level on the easiest difficulty is available at first and completing that will unlock both the next difficulty step up and the second level. There are incentives other than self-motivation for pursuing and unlocking all the levels. After successfully completing a level either a song for the jukebox, a new Ghost or a relic; these add buffs to one of the Ghosts, will unlock. Accompanying each level is a body of text that adds some narrative and contextualises Poe, her actions and her environment. Gameplay is very much at the forefront of this game but it's nice to see other areas being explored. The three levels are fun to play but the first level is by far the weakest in my opinion. It doesn't make great use of the audio and feels a little uneventful, though still difficult, when compared to the other two. On the other hand, it does have the best boss fight of the three levels. One that really should come with an epilepsy warning. It's levels two and three that will stick in my mind and see me revisiting the most. There is a fine line between satisfaction and frustration and A City Sleep lies very close to it. I was able to complete the three levels on the easiest 'lucid' difficulty with relative ease once I felt comfortable with the game but the challenge really ramps up with just the next step up. 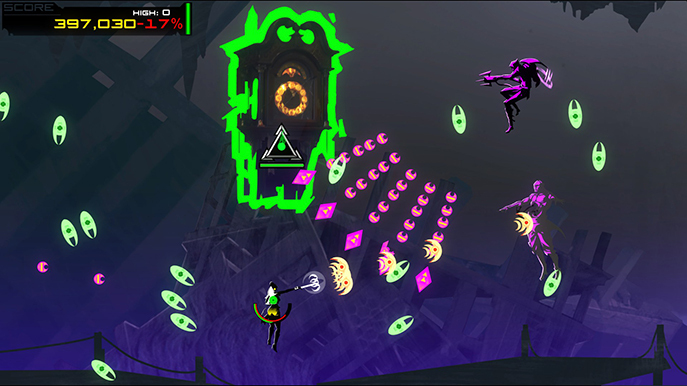 The increased difficulty features a greater number of enemies on top of those you have already faced and extra projectiles. The checkpoint system is pretty good. You'll start at the beginning of the section you were slain, though if you die at the hands of the boss you'll spawn at the start of the third part of the level. I died many times trying to complete the levels on the second difficulty and felt great satisfaction when I accomplished it. The next level of difficulty introduces curses; a state that is affected for that level � double damage taken or faster projectiles for instance. I've not yet been able to finish them. A City Sleeps won't be for everyone. Those with a skill and passion for bullet-hell type games will find great enjoyment here while entry-level players may struggle with the first set of levels. There is a twist to the formula leaving the game feeling both fresh and familiar. The audio-visual synchronisation is the highlight of the experience. The points where the music changes pace or tone within a level and everything thing you see reacts appropriately. The difficulty in completing the more challenging levels will keep you coming back. I know I certainly will. 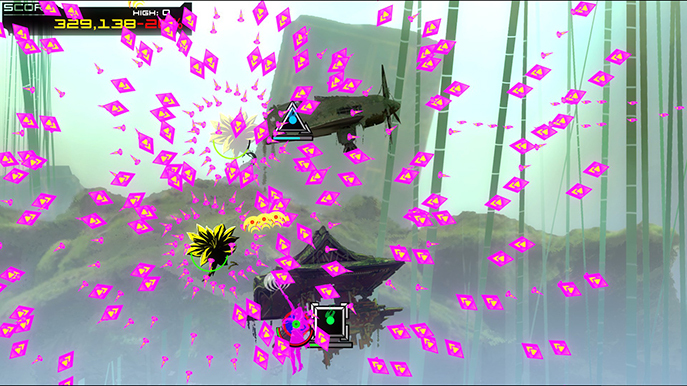 + Audio-visual synchronisation is very effective and adds a new twist on bullet-hell shooters. + A number of fun and varied mechanics aid you throughout the levels. - ...but may be too challenging for entry-level players. - First level isn't as good as the other two.